Fresh ideas! Fresh ideas! Who’s looking for some fresh ideas? The flowers are starting to bloom and we couldn’t help but think of garden weddings and how sweet it would be to plan one. Lucky you, bride-to-be, that you’re doing this right now! Did you know that unless you live in Scotland where outdoor weddings are legal, it isn’t actually legal to get married outdoors in the U.K. unless you do so under a fixed roof? That’s right. It doesn’t need to have walls, but must have a fixed roof, like a pagoda. 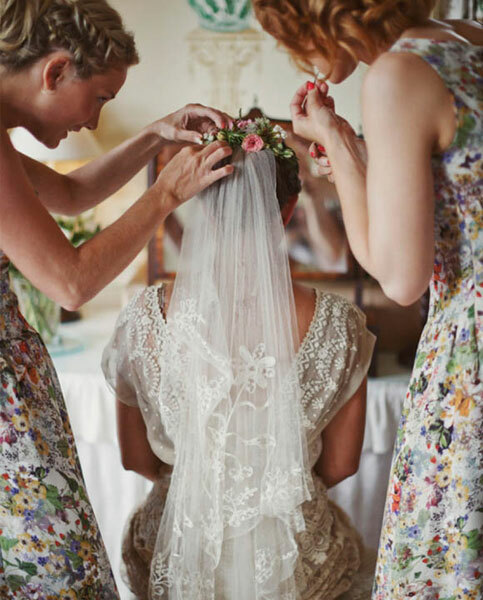 If you visualise your day completely out in the open, then Boho Weddings suggests holding a blessing instead of a legal civil ceremony: “Many couples are choosing to do the ‘paper work’ side of the marriage the day before, or earlier in the morning in a registry office and keep it very low key, and then have the wedding they really want in the form of a wedding blessing, which gives them much more flexibility in their choice of location. By choosing this option it basically means you can get married whenever, and wherever you wish.” Very good to know! Speaking of covered areas, if your setting is all outdoors without an indoor option for the wedding reception, think of offering some kind of covering. The weather is not reliable in the U.K. and chances of rain are high. So, it’s important to always have a plan B in place! 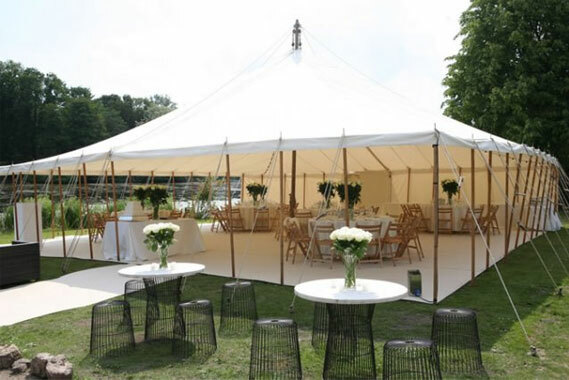 Pictured here are tents provided by Whatton House & Gardens, a gorgeous estate set in the heart of Leicestershire. We also recommend thinking about items for guests in case of any weather woes, such as blankets for a frigid day, umbrellas for rain or hot sun and fans for an unexpectedly steamy day. 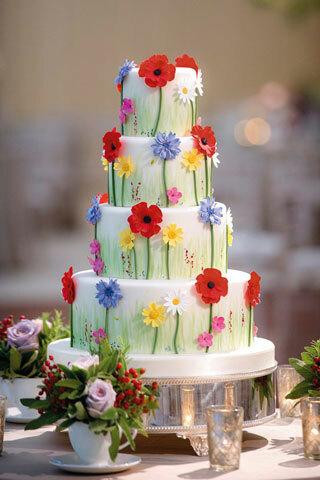 Pretty little sugar posies climb each of four tiers of this garden-perfect cake. What’s inside? Extraordinary chocolate and vanilla-raspberry cake, by The Cake Parlour and featured on Brides. Playing up the colours of wild-flowers throughout your wedding décor creates a happy, bright atmosphere. 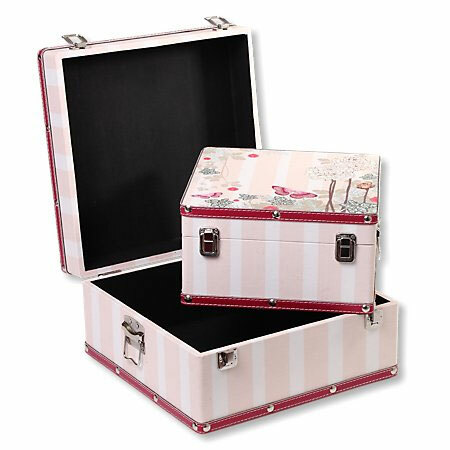 These versatile wooden-style Pink Keepsake Boxes (Set of 2) feature a garden motif on the front of the case with a butterfly and flower print. Use them for your ceremony or reception décor—think candy buffet containers or bursting with wild-flowers for aisle style—and then fill them with keepsakes and store at home! Like the look of the Pink Keepsake Boxes? 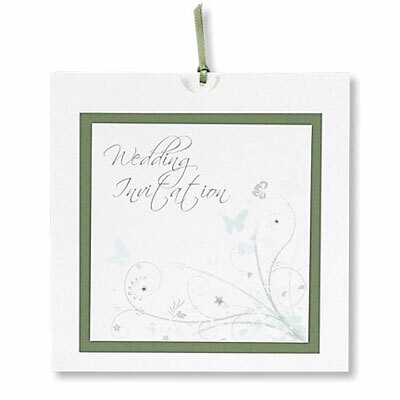 Browse the collection of romantic wedding keepsake boxes. Just think…this could be you! Found on Love My Dress blog, this bride designed her bridesmaids’ dresses with her sis (one of the ‘maids). They chose the fabric, shape and then worked with a tailor (Finiks) to get the dresses made. The result: feminine, bright, unique and 100-percent garden wedding style! Side note: you can use the extra fabric for paper flags, signs, on favour boxes, ribbons, and more, like she did below! If you plant them, they will grow! This smarty pants bride filled tin pots with daffodils for very budget-friendly and delightful ceremony décor, found on Rock My Wedding blog. Show off your own personal Alice in Wonderland creativity with the Wonderland Day Invitation, which features flowers, butterflies, diamantés and glitter for a bold and interesting look. Plus, wedding details go “peekaboo” when guests pull them out of the pocket invitation! Fallen in love with this final invitation? Get the Wonderland Day Invitation at B&G Direct. 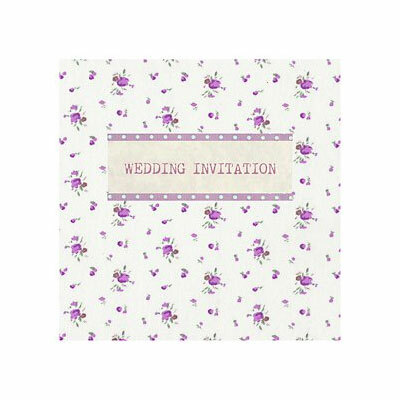 Affordable Enchanted Garden Wedding Invites & Stationery Available Online! 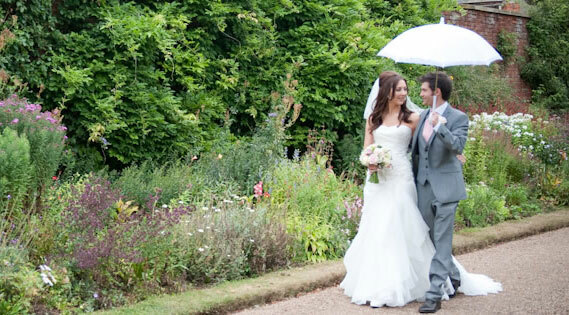 We wish all you brave brides best of luck for your upcoming garden weddings, fingers crossed for the weather! If you are in need of luxury stationery and wedding accessories at incredible prices, make sure you shop online at Bride & Groom Direct. Don’t miss our October Sale! See how much you can save by shopping at Bride & Groom Direct in the wedding invitations and reception accessories sale. Want to join thousands of brides receiving regular tips, advice & trends via e-mail? Fill out your e-mail below!